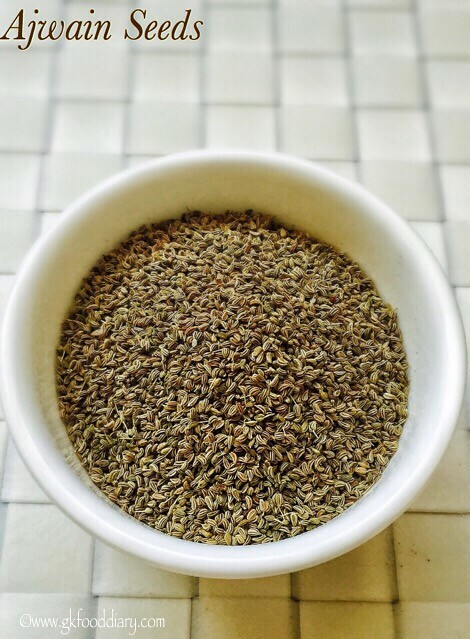 Ajwain/Omam/ Carom seeds/Omam is a best Indian spice which has various health benefits. It has antibacterial properties and works effectively for relieving cold, cough & congestion. Ajawin potli is a natural inhaler and works as a soothing home remedy to treat stuffy nose and chest congestion in babies, kids, and adults. 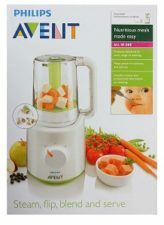 It can be used for babies from 6 months after consulting with the baby’s doctor. Also, check the ajwain water recipe for treating cold and cough in children. 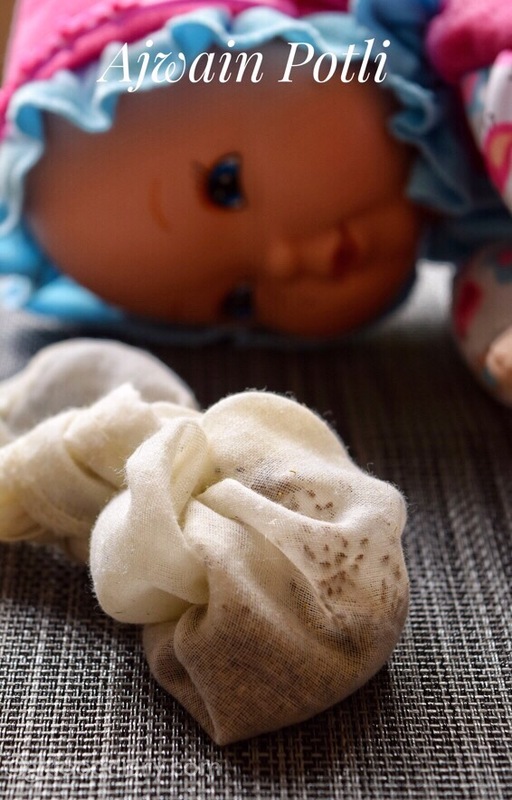 For babies below one year, when the baby has a cold, you can place it near your baby’s bed/baby cot/cradle or where the baby sleeps. It helps to open the blocked nose and relieve from congestion. Don’t place it too near to the bed to avoid the chances of putting into the mouth, breathing risk or choking in anyways. For babies above one year, you can do massage with the ajwain potli. Firstly, make sure the potli is warm and not too hot, before using for baby. Check the potli temperature by placing in on your wrist. Rub the potli smoothly on the baby’s chest, feet, back, and palms to relive from a runny nose and congestion. Do it 2-3 times a day for faster results. For older kids and adults, you can ask them to hold the potli and inhale. The fragrance helps them to get rid of a runny nose and congestion after inhaling the same. Always make a small potli and tie it tight so that it won’t get spilled. Use only fresh potli every time to get the most benefits of it. Now let’s get on to check how to make ajwain potli for babies, toddlers, and kids. 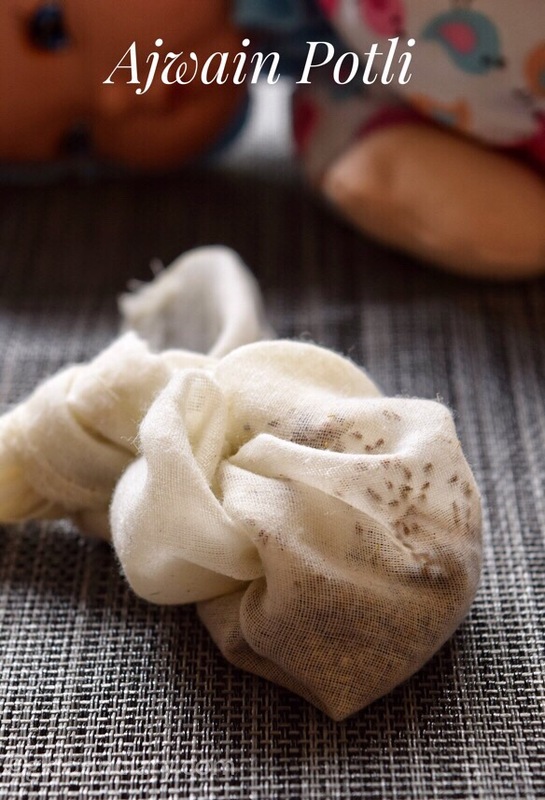 Ajwain Potli for babies, toddlers, and kids - a detailed post on how to make Ajwain potli for treating chest congestion and runny nose in babies and kids. Take 1 tbsp of ajwain seeds. Clean the seeds by discarding muds if any. Organic ajwain seeds won't have impurities in general. Heat a pan and dry roast ajwain seeds in low flame until crisp and nice aroma comes. It may take 3-5 minutes. Switch off the flame once done. 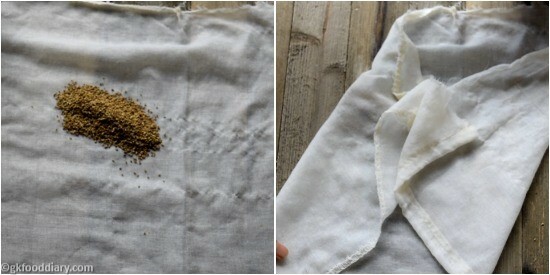 Transfer the roasted ajwain seeds into clean cotton cloth/muslin cloth. Bring the edges to center. Put a knot tight to make a pouch/potli. Ajwain potli is ready! 1. 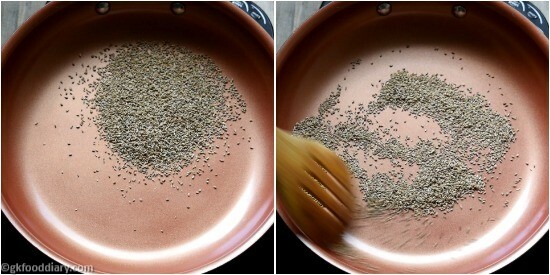 Take 1 tbsp of ajwain seeds. Clean the seeds by discarding muds if any. Organic ajwain seeds won’t have impurities in general. Heat a pan and dry roast ajwain seeds in low flame until crisp and nice aroma comes. It may take 3-5 minutes. Switch off the flame once done. 2. 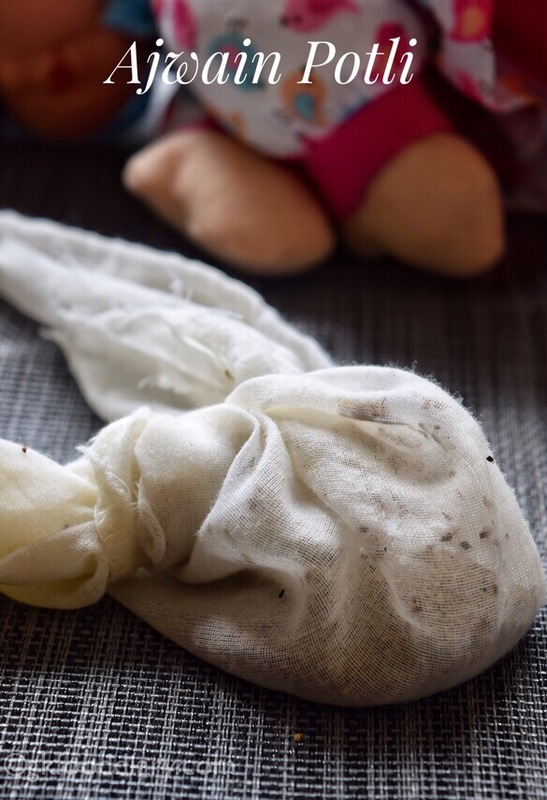 Transfer the roasted ajwain seeds into clean cotton cloth/muslin cloth. Bring the edges to center. 3. Put a knot tight to make a pouch/potli. Ajwain potli is ready! Use a light, clean cotton cloth/muslin cloth to make this ajwain potli. Always check with your doctor before trying any home remedy to your baby. Make sure to use husk free ajwain seeds for baby and kids.